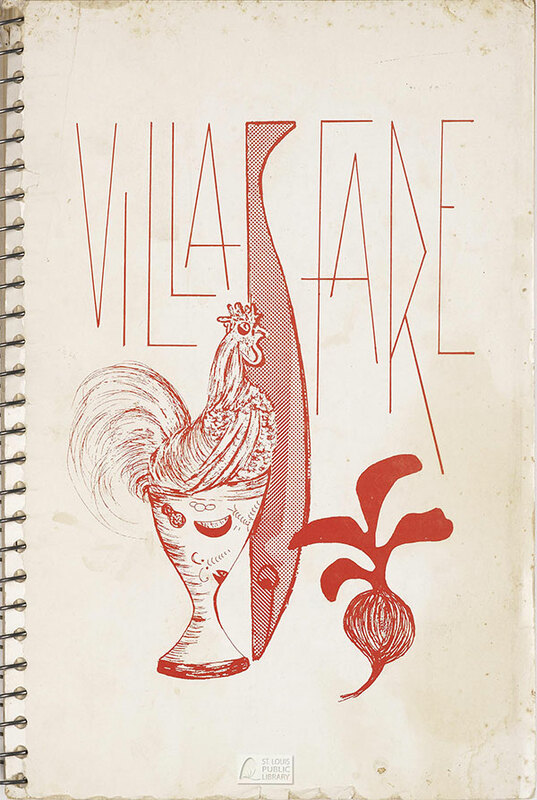 Recipes from the kitchens of Villa Duchesne mothers, Villa Duchesne alumnae, Villa Duchesne friends--spiced with recipes from prominent personalities such as President John F. Kennedy, Princess Grace of Monaco, Eleanor Roosevelt, and St. Louis’s own Stan Musial. Villa Duchesne is a private Catholic school in the Sacred Heart tradition which opened in 1929. This collection of recipes was compiled in 1961. 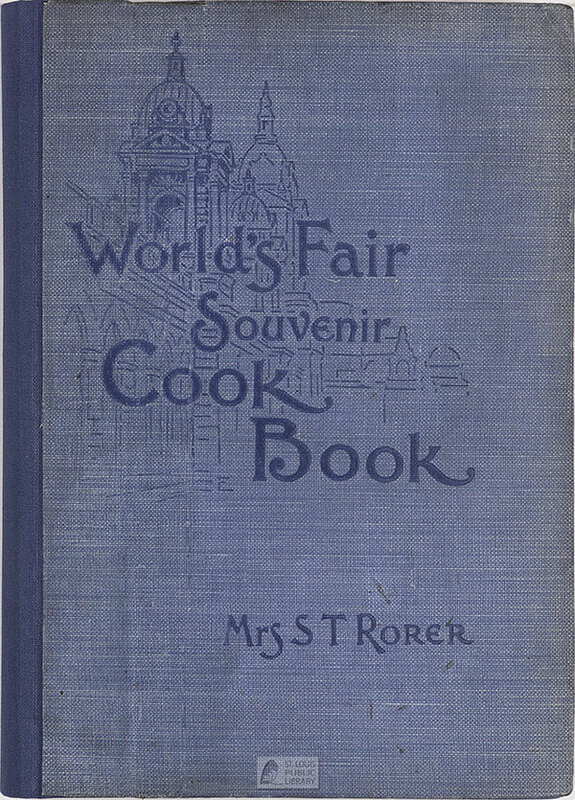 Cookbook produced in conjunction with the 1904 Louisiana Purchase Exposition by Mrs. S. T. Rorer. Sarah Tyson Rorer was a nationally known cooking school teacher best recognized as the author of Mrs. Rorer's NEW Cook Book Philadelphia Cook Book, Canning and Preserving, etc. 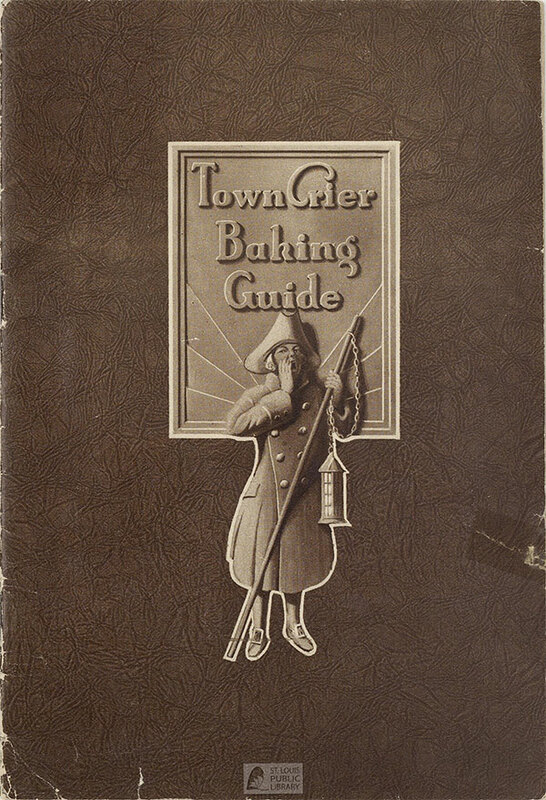 This collection of recipes was used at the Model Restaurant located at the Fair’s Eastern Pavilion that was under the direction of Mrs. Rorer. 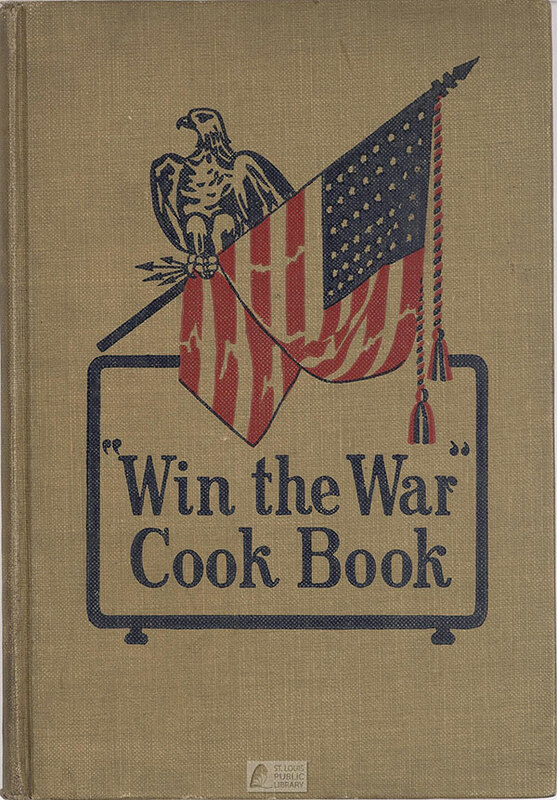 Cookbook published by the St. Louis County Unit of the Woman’s Committee Council of National Defense in 1918. 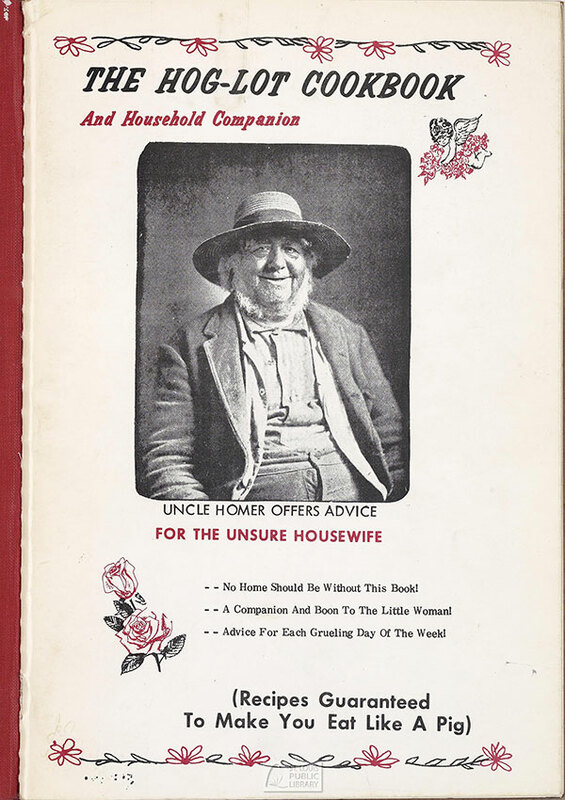 The purpose of this book was to aid those on the homefront during the First World War. 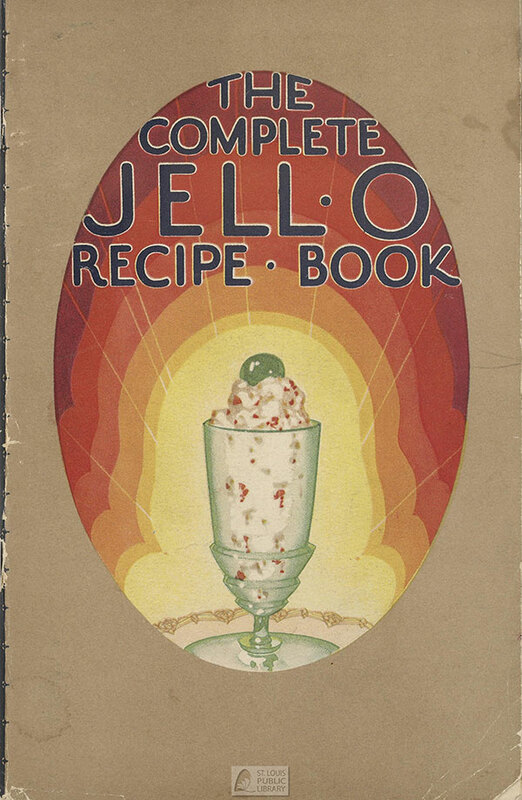 Much more than a dessert, this inspired Jell-O recipe booklet from 1929 reveals creative uses from molded salads to savory entrées. Jell-O became a staple of housewives due to a successful marketing campaign and the widespread availability of refrigeration. 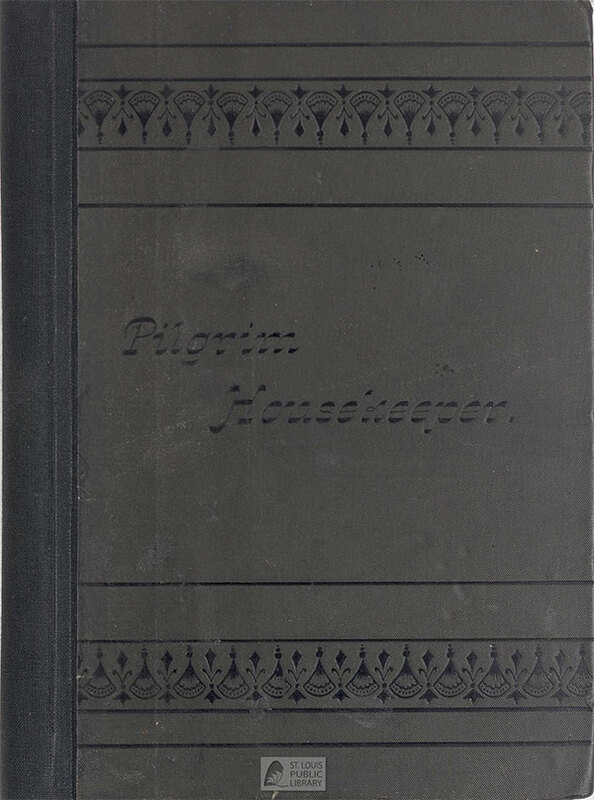 Recipes contributed by the ladies of Pilgrim Church, St. Louis, and published in 1886 for the benefit of the Ladies Home Missionary Society; ed. by Mrs. D.D. Fisher, Mrs. H. Brinsmade, Mrs. C.W.S. Cobb. This is the oldest cookbook in the Culinary Collection. Recipes tested and tasted by the St. Peter's Woman's Guild. 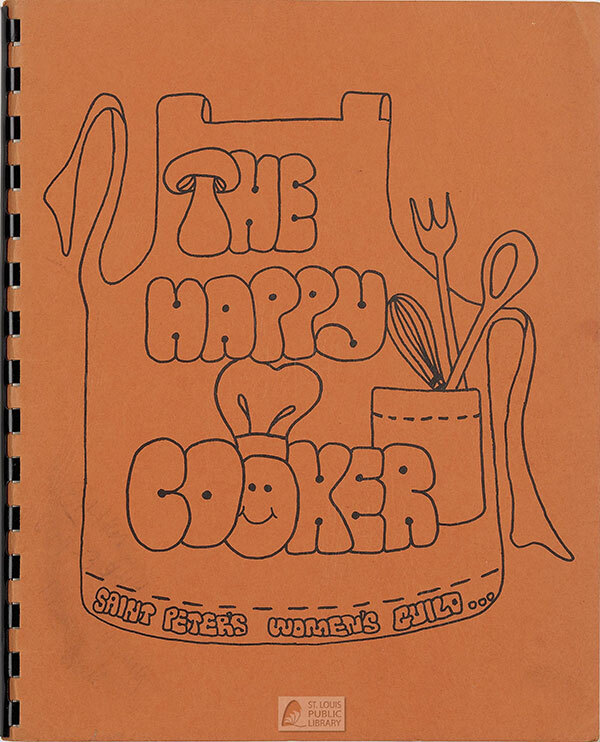 The Happy Cooker was edited by Connie Lohr and Lynn Staley. The artwork and poetry was done by Julie Charles. 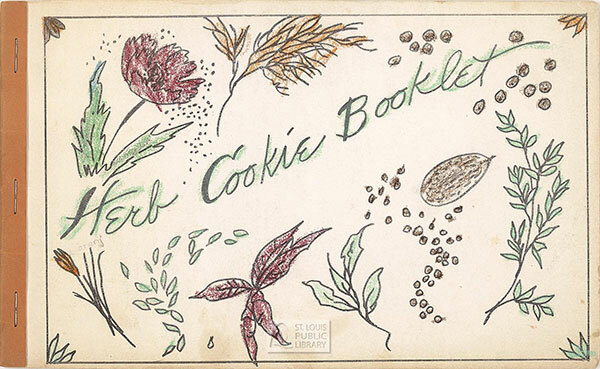 Collection of assorted recipes offered by members of Arrow Rock, Missouri's Hand Weavers Guild. 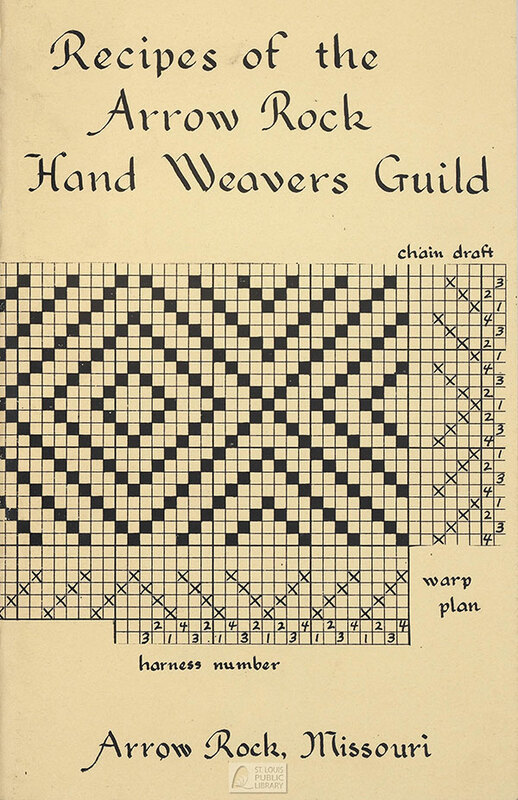 The Guild was founded May 10, 1973. Illustrated throughout with fiber arts related drawings. 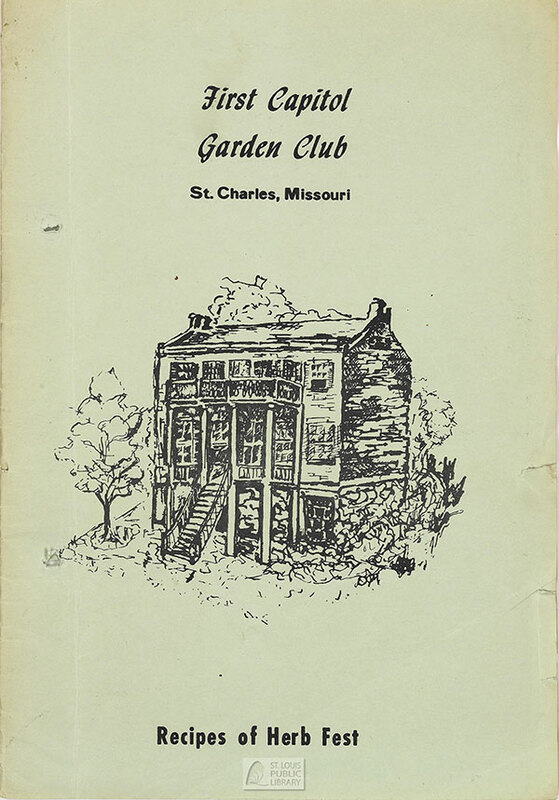 Variety of recipes served by the members of the St. Charles, Missouri First Capitol Garden Club at its Herb Fest held on September 2, 1977. The members participating were Mary Colaw, Martha Dyer, Bunny Eckhoff, Dolly Hood, Jane Horning, Judy Horrocks, Lana Lyons, Dorothy Maran, June Mouldrow, Ruth Mullins, Sherry Nieters, Mae Jean Nothstine, Janice Ohmes, Margret Ohrman, Marie Paugh, and Melba Wilcox. Humorous collection of recipes for every day of the week from late editor, columnist, reporter, and publisher of the Clinton Daily Democrat, Kay White Miles. Illustrated throughout with vintage advertisements Majestic Manufacturing Company which was based in St. Louis. 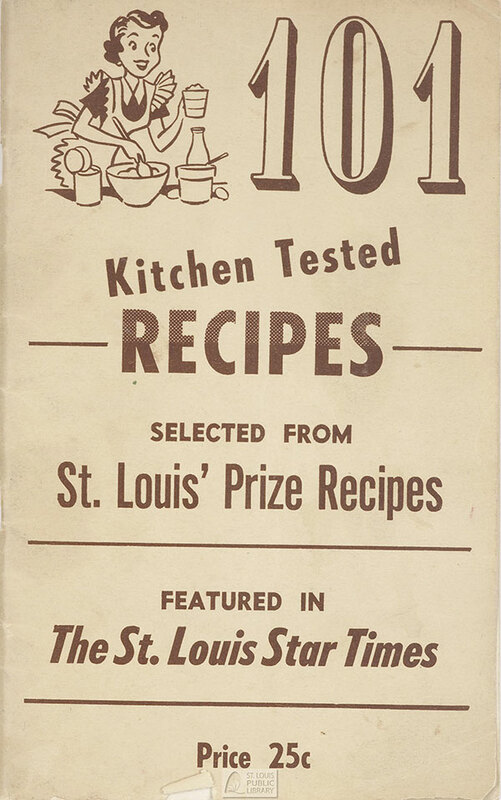 Recipe favorites of your St. Louis neighbors reprinted from St. Louis' Prize Recipes, a daily Star-Times feature. St. Louis area homemakers who submitted 7,841 recipes to a contest held by the newspaper. The 101 presented recipes were selected by Mary Kimbrough, Star-Times women’s pages editor and a committee. Every recipe was kitchen tested by home economist before being published in 1949. Recipes tested by Mrs. Marvin Harris, member of the St. Louis Herb Society. The society was founded in 1941 as a study group dedicated to the purpose of educating people in the knowledge and use of herbs. The society continues to regularly publish cookbooks. 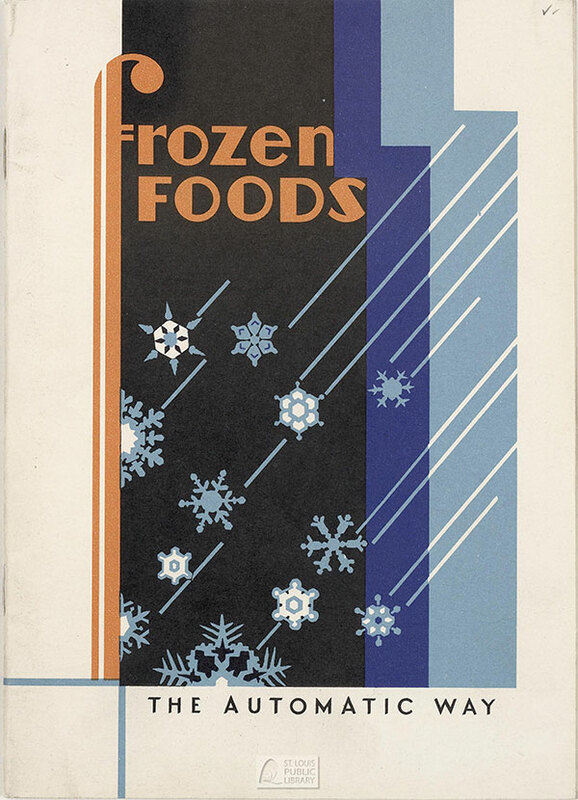 Prepare delicious and delicate frozen desserts without using a hand crank ice cream freezer with this 1931 recipe booklet from the Evaporated Milk Association. Orange and blue color illustrations throughout. The Evaporated Milk Association was located at 203 North Wabash Avenue, Chicago, Illinois. 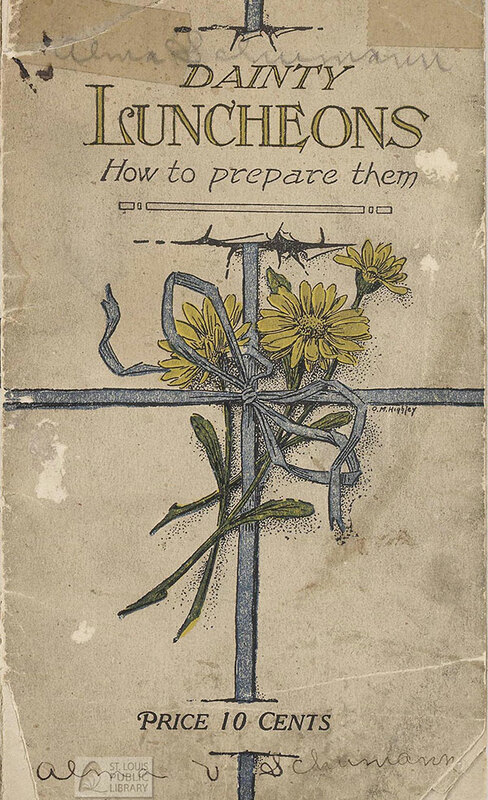 Turn of the twentieth century pamphlet published by The Woolverton Prining Comapany of Osage, Iowa that featured complete menus for preparing "dainty luncheons." The original cost of the recipe book was ten cents. Recipes arranged in menu format. 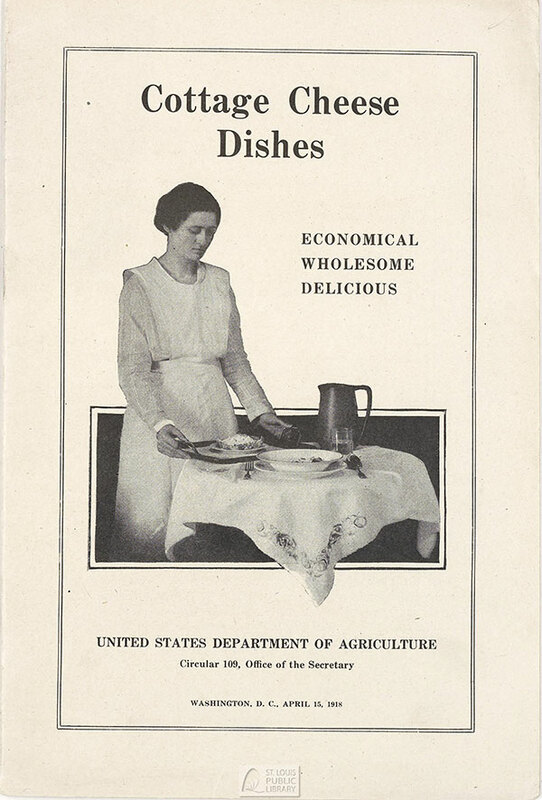 This 1918 recipe leaflet from the U.S. Department of Agriculture promotes cottage cheese as a nourishing, muscle-building alternative to meat in one's diet. Distributed at no cost by the U.S. Department of Agriculture to citizens. Recipes include desserts, main dishes, and starters.